Charles Simmonds fools the third base runner into coming home by throwing a potato into left field! He represented the M.C.C. Baseball Section from 1914-1918, NSW Baseball Team 1904-1913. Australian representation 1908 vs Great White Fleet. MCC A Grade player 1914-1918, Baseball Captain 1915-1916, Premiership player VBU A grade 1916, MCC Treasurer 1930-1941, MCC Vice President 1941-1957, MCC President 1957-1965. 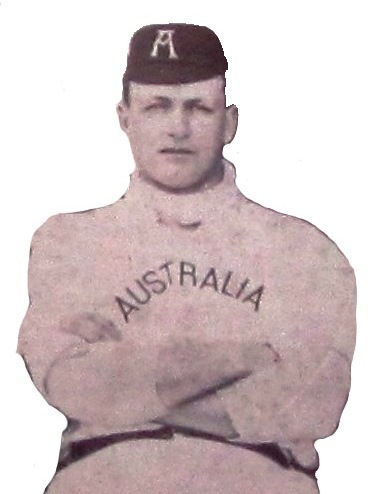 Charles Simmonds was an outstanding catcher in NSW for many years, who had appeared for Australia against US Fleet teams in 1900 and 1908 and captained his State many times, transferred to Melbourne in 1914 and joined the MCC. Charles went on to become President of the Melbourne Cricket Club from 1957 to 1965. Many stories are told about Charles Simmonds in those days. Not all of them have been substantiated, but this one was interesting. On one occasion C. W. Simmonds was catching and there was a man on third. After taking a pitched ball, Simmonds inconspicuously took a white potato from his pocket and hurled it towards third base. It sailed high over the baseman’s head. The runner on third, thinking it was the ball, immediately took off for the home plate with thoughts of a certain run. As he ran towards home Simmons casually tagged him with the ball, which had been carefully concealed in his glove! It could be a rugged game at times. One time when he was playing against the MCC at Rushcutters Bay, Sydney, Simmonds ducked a ball from Dr Twiss; it hit him on the head and bounced right out of the field into the tennis courts. Baseballers, apparently are built for that sort of thing and he was uninjured. Another time, on the MCG, when NSW was playing Victoria, Simmonds was stealing second base. J. Balantyne, short stop, covered second base, went to tag Simmonds, but missed his body and hit him on the chin: with the ball. He knocked him unconscious. Later Charles Simmonds introduced him as the only man who ever knocked him out. On the left was Balantyne, 10 stone, on the right, Simmonds, 12 stone. Charles was honoured with MCC Life membership in 1939. MCC Honorary Life membership recognises outstanding service to the club. It has been bestowed sparingly and, including visiting royalty, only 82 members have been honoured since the club's foundation in 1838.